The Nightfallen are a faction that you encounter in the Suramar zone of Legion. Unlike the other reputations, the Nightfallen actually have prerequisites outside of just leveling. This is mainly due to the fact that you start at unfriendly with them. Before you can do anything with the Nightfallen, you will need to complete a quest chain to gain their trust. This quest chain will award you the Nightfallen But Not Forgotten achievement, in which you need to complete 6 storylines. You will need to be level 110 before doing any quests for the Nightfallen. As soon as you reach 110, you can go to your adventure journal and start the quests in Dalaran to take you to Suramar. There are a huge number of quests in Suramar that are not required for this achievement, so you can find a list of how to start each storyline below. Nightfall — This will be your first quest line, given to you by the adventure journal. The quest name is Khadgar's Discovery and the final quest of the chain is Arcane Thirst. Feeding Shal'Aran — You start this quest line with Shal'Aran and the final quest of the chain is Feeding Shal'Aran. Arcanist Kel'danath — This quest line starts with An Old Ally and finishes with Kel'danath's Legacy. Masquerade — This quest line starts with Masquerade and ends with First Contact. The Light Below — This quest line starts with Arcane Communion and ends with The Valewalker's Burden. Once you have completed all the quest chains listed above and earned the achievement, you will have unlocked the World Quests for The Nightfallen. For the Nightfallen, you gain reputation by completing world quests in the Suramar zone. Each quest will normally award 50-350 reputation, depending on the goal. These quests have varying reset times, depending on the reward, so they will not always be available. There are also bonus quests that appear on your server for a few days, which require you to complete a number of world quests in an area. Once you have completed 4 of the world quests in Suramar you can complete a quest with the Nightfallen Emissary (First Arcanist Thalyssra) who also acts as a Quartermaster. This will award you with 1500 reputation. The objective of the scenario is simply to kill as many mobs as you can, while maintaining as many of your Withered soldiers as possible. As you kill more mobs, your score will go up. The higher your score, the better your prizes at the end. As you progress through the scenario, you will have the option to pick up chests with loot in them that helps your Withered soldiers in the future, such as boosting their HP or upgrading the soldiers. In order to pick up a chest, you need to sacrifice a number of Withered soldiers to carry it back to the start. The scenario will finish as soon as you die or when you have used up all of your Withered soldiers. 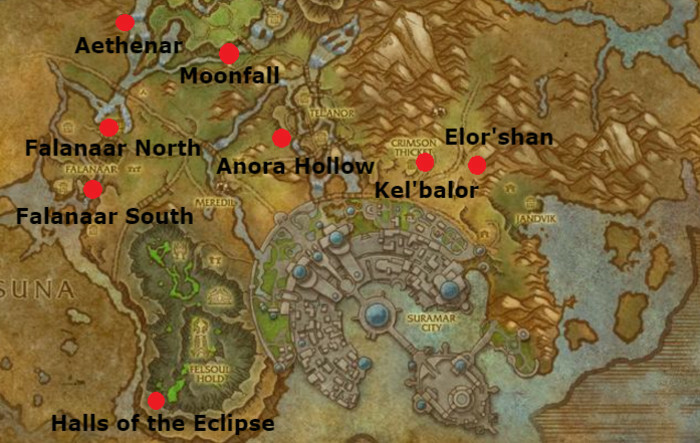 With your help, the Nightfallen wish to re-open the leyline feeds of Suramar; you will be granted reputation for each one that you fix, whether by clearing an area of mobs or paying a fee in Ancient Mana. The locations of the feeds are as follows. Anora Hollow (Power Grid) — This is the first ley station you will encounter when questing through the Suramar zone. It will unlock all the other ley station quests. Moonfall (Leyline Feed: Ley Station Moonfall) — You need to find the broken dish and spend 200 Ancient Mana. Aethenar (Leyline Feed: Ley Station Aethenar) — Find the broken fragments and spend 200 Ancient Mana. Falanaar North (Leyline Feed: Falanaar Arcway) — Spend 200 Ancient Mana. Falanaar South (Leyline Feed: Falanaar Depths) — Spend 250 Ancient Mana. Halls of the Eclipse (Leyline Feed: Halls of the Eclipse) — Spend 250 Ancient Mana. Kel'balor (Leyline Feed: Kel'balor) — Defend the feed from monsters and spend 200 Ancient Mana. Elor'shan (Leyline Feed: Elor'shan) — Spend 250 Ancient Mana. You can find all of the locations on the map below. Each leyline feed that you find and re-activate, excluding the starter quest in Anora Hollow, will reward you with 75 reputation with the Nightfallen, as well as a permanent buff to the amount of Ancient Mana mobs will drop. This buff, Ancient Mana Scavenging, is gained through quests with Arcanist Valtrois that can only be unlocked after finding the leyline feeds. Nightfallen Insignias grants 250 reputation per use. You can find them in treasure chests across the Broken Isles, as well as being a reward from certain Class Order Hall missions. Certain dungeons in Legion will award reputation for their respective factions. For the Nightfallen, you will not gain any reputation from dungeons. Given the fact that there are no strict dailies in Legion for the reputations, it can be difficult to provide an accurate estimate. Generally, getting the reputation to exalted takes between 1 and 2 months for an average player, assuming completion of all of the criteria listed in the guide, every time they are available. Once you have reached exalted with the Nightfallen, you will start earning paragon caches. These caches are granted for each 10,000 reputation you earn with a faction after hitting exalted with them. Inside, you have a chance to receive the normal rewards of an Emissary cache, such as gold, as well as a faction specific-mount. When completing the paragon for the Nightfallen, you will receive the Leywoven Flying Carpet. * We currently do not know how to obtain Scroll of Elun'dris. 06 Sep. 2016: Added Leyline Feeds. 02 Sep. 2016: Added Training Scenario section.